The avid trout fisherman will already be aware of the awesome and legendary fishing that the cold waters of the North Fork and White River tailwaters have to offer. The beginner fly fisher person only needs to read a few of the articles and should then become equally excited about planning their trip here. The North Fork of the White River was home to the world record Brown Trout 38 lbs. 9 oz. (six days later a 34 lb. 8 oz. Brown was caught in the same area) until it was beaten by a new, world record Brown (40 lbs. 4 oz.) caught on the Little Red River. The Little Red River is also part of the White River complex. Other record trout caught in the cold waters of the North Fork River include a 5 lb. 0 oz. Brook Trout. The tailwaters of the White River accounts for record breaking state records for Rainbow Trout, 19 lbs. 1 oz. and the Cut Throat Trout, 9 lbs. 9 oz. Will you catch a new, world or state record trout on your visit with us? We sure hope so. Will you catch fish? Most definitely! Equally as important, you will have fished in one of the most relaxing environments one can find. You will have fished on streams that have unparalleled natural beauty. The serenity and beauty of the clear water with riffles, shoals and pools can only be surpassed by the majestic stature of the bluffs, cliffs and caves that line the banks of the streams. Wildlife is abundant all along the banks of all the rivers. Eagles, deer, elk, black bear, mink, beaver, turkey, fox, waterfowl and maybe even a Razorback are likely to cross your path while you meander down one of the streams. All of this beauty and wonderment won’t put more fish in your creel, but it will make those fish seem bigger than they actually are. If you plan on fishing the river complex by boat, plan on renting one, unless yours is a riverboat. Anything other than a shallow draft riverboat or canoe will be cause for going aground and making your outing more work than pleasure. Well, I’m sure you will want to read more about what this fisherman’s paradise has to offer. You need answers to what are the best times of the year, the best times of the day to fish for trout. You will want to know what type of fishing gear to use, and do you need waders and if so, what kind. What bait do the stripers hit on and when do the really big Browns spawn. Well, we hope that some of your answers will be found on the following sources of the Internet, or in the recommended books and articles. The BEST way to learn the answers to all your questions is to visit with us and enjoy our facilities. We know you won’t be sorry you did. The best accommodations, the best fishing, the best environment and the best time to be had are all here waiting for you. Give us a call today. 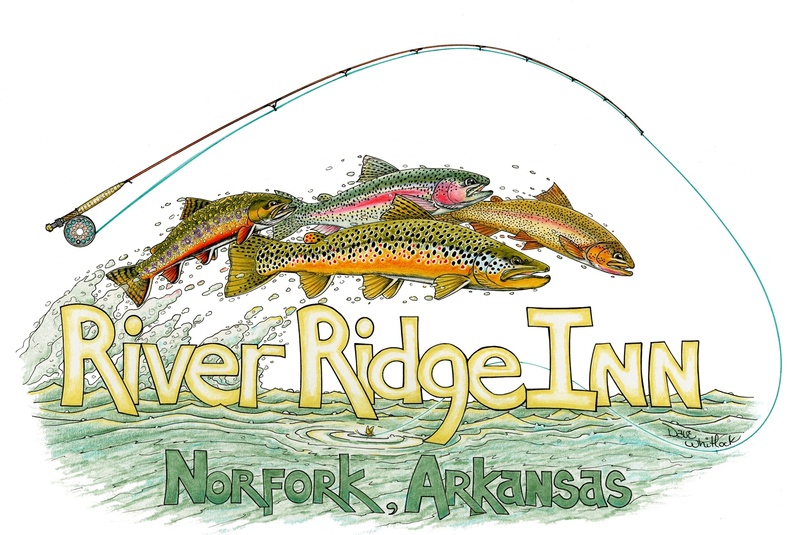 The Fly Fishing Academy at River Ridge Inn is the BEST way to be introduced to the art of fly fishing. It is also one of the only facilities that specializes in teaching children from 5 to 16 years of age. No one teaches advanced techniques better, or in more detail, than the instructors at the Academy. Please click on "The Fly Fishing Academy" and "Guides" for more information.